Should you rely on partnering benchmarks and best practices that are based on information from �similar� business sector companies and competitors to improve the results from your business partners? Will the costs of implementing them outweigh their potential gain before you have to adjust them for the next year? Do all partnering KPIs weigh the same for each partner that your company has? How do your company�s current partner management KPIs effect and interact with each other? How do your company�s current partner selection KPIs effect and interact with each other? How do your company�s current partner agreement creation KPIs effect and interact with each other? Can you tie your KPI measurements back to the processes, policies, programs and personnel that enable the results that they measure? AllianceAnalytics has been granted two US Patents for creating business intelligence and reusable knowledge for single and cross-industry channel, alliance and business partnerships. The patents enable companies to create standardized, repeatable and measurable partner selection, agreement creation and management processes and enable partnering continuous improvement. Our system and method enables companies to identify the root cause variables and indicators that help or hinder the achievement of expected partnering results. When you add in its ability to tie these effect indicators back to the processes, policies, programs and people that enable partnering results, it creates a continuing competitive advantage. It leads to more predictable results. It enables a company to adjust its partnering programs mid-stream instead of a new fiscal year. With AllianceAnalytics solutions, you can establish your own benchmarks and create and improve on your own best practices. For Technology companies, Partner Value Optimizer provides the feedback needed to improve partner trust, adjust and optimize processes, decrease costs without impacting results and create the right mix of partners needed to achieve ongoing results. For Pharmaceutical and Biotech companies, Partner Value Optimizer uses its patented algorithms to shorten innovation and R & D cycle times while decreasing the cost of innovation. It assists in capturing information that will shorten all aspects of the Drug Development Timeline. For Financial Services companies, Partner Value Optimizer stands alone in its ability to provide the information needed to regain and re-establish the trust of its partners that ultimately control access and sell to their end consumer Customers. What would it be like if you had the solution to these challenges in hand? 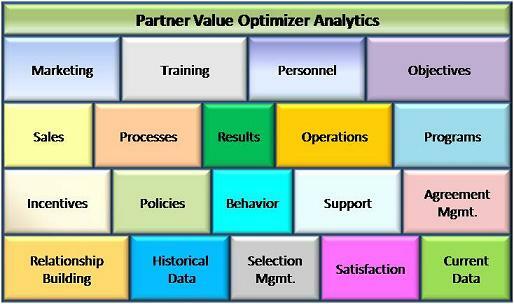 Partner Value Optimizer (PVO) is the ONLY software partner analytics solution for creating REAL Business Intelligence and Predictive Analytics by combining the structured and unstructured data needed to make informed partnering decisions as it brings true innovation to the creation and proactive management of strategic alliances and partnerships. PVO identifies the unexpected so that there are no surprises in your sales performance management strategy as it applies to ALL types of alliances, channels and partnerships. PVO was developed with one objective in mind - to increase the asset value contributed by a company's strategic alliances and partnerships. When it comes to strategic alliance and channel performance measurement, metrics and analytics, there is no other solution that can provide the business intelligence needed to maximize growth, effectiveness and value. We invite you to explore our website and contact us to see how PVO can assist your company in increasing its partnership portfolio's effectiveness and results and turn the tables on competition.